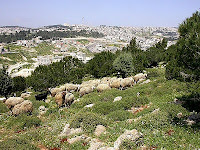 On a hill not far from Bethlehem, fifteen-year-old Nathaniel knelt beside Nimbles, his favorite ewe and calmed her with his whispers. The sheep were restless, more so than usual. Sounds carried far in the still night and it had been hours since he heard the wolves howling in the wilderness miles away. With ten years of experience, Nathaniel knew not to trust the silence. On a night such as this as an eight year old boy, he’d had his first run-in with a wild animal. He’d awoken to the sound of a bleating lamb and had rushed over to see a huge black shadow swing it’s massive paw and bat the lamb away like a fly. The shaken lamb stood by the side, quivering while its mother took a couple steps and stumbled. The bear had stripped four slices of flesh from her side and the sight had made Nathaniel tremble with rage. Sling-shot in hand, the young shepherd had reached in his pouch and snapped pebble after pebble at the huge beast, hitting its eyes, nose and even its teeth before it finally turned and bounded away, braying its displeasure. Nathaniel still remembered the rush of pride when Josiah and the other shepherds slapped him on his back and said he’d been of great service. It sure offset the sadness he had felt at losing the ewe. Over the years, Nathaniel had faced many beasts including lions, wolves, jackals and hyenas when the beasts came up out of the Jordan River gorge looking for a fresh food source. He knew he shouldn’t gloat about his successes at defending the flock but it was hard to be humble when God had blessed him with the most accurate shot of all the shepherds. Nathaniel looked up at the heavens and marveled at the brilliant light hanging like a beacon in the eastern sky. Unlike other stars, this one grew in radiance, even outshining the moon. Nathaniel looked over his shoulder to check Josiah’s reaction but the older shepherd just leaned on his staff and stared. When Nathaniel looked back at the star, he saw it shooting a gleam of light right into the town below. He’d never seen such a sight yet he knew from stories passed down through the generations that God had appeared in different forms to convey a message to His people. Nathaniel felt his chest expand at the thought he would be the receptor of such a message. Surely it proved God, too had heard of his bravery. And so he stood, feet planted in a wide stance, sling shot tucked in his belt, hands hung at his sides, waiting. Within minutes, a man garbed in white appeared before them, his robes flowing from an unseen wind. Nathaniel knew without doubt this man was the angel of his forefathers. Yet even as he straightened to his full height with his chin jutting out, his insides twisted as if the hand of God Himself was wringing the sin right out of his body. And then the angel said, "Do not be afraid. I bring you good news of great joy that will be for all the people. Today in the town of David a Savior has been born to you; he is Christ the Lord. This will be a sign to you: You will find a baby wrapped in cloths and lying in a manger." Nathaniel cocked his ear toward the angel. Surely he had missed something. Instead of giving him instructions, the angel only spoke of a babe’s birth. But before he could raise a question, the heavens erupted in a dazzling light and a whole choir of angels appeared singing, "Glory to God in the highest, and on earth peace to men on whom his favor rests." On and on they sang, their perfect voices building with such magnificence and timber they covered Nathaniel in awe and set his knees trembling. The power behind the spectacle seeped into him and he knew one whisper from the Almighty could blow him over like a grain of sand. And then the words of the choral jubilation sunk in and the young shepherd understood the proclamation. The Messiah had come at last! The beautiful star pointed the way to the place where God’s own son awaited them. It was true. It was true! Nathaniel had been chosen to serve God’s son. In a heady daze, Nathaniel heard Josiah say, "Let's go to Bethlehem and see this thing that has happened, which the Lord has told us about." Nathaniel took a step down the hill then stopped and looked back at his flock. He had never left his sheep unattended and yet, as he watched the others rush down the hill, Nathaniel knew on this special night, God would not let any harm come to them. 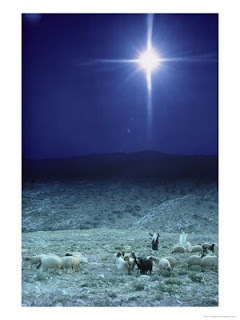 The shepherds raced, stumbling and jostling down the stony hill, through the narrow streets and around the public wells until they stopped before a stable. With shoulders shrugging and questions on their lips, they stood confounded until finally Nathaniel with his youthful curiosity stepped inside the tiny building and stared in awe at the light which drove right through the roof and shone down upon a babe in the manger. Barely clothed, the infant lay asleep with his mother resting nearby whilst his father stood guard. Here in this dirty, shelter amidst the animals, hay and manure the angel’s song rang strong in Nathaniel’s ears. This was God’s son. Nathaniel didn’t understand how a tiny human could be God’s own son, but in his heart, he just knew it was so. This was the task set forth for him. He was the one chosen to spread the news. The Messiah had been born! 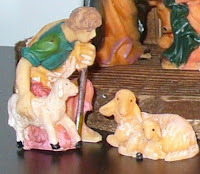 When I started writing about the young shepherd, I only wanted to portray the fear he felt as he faced the multitude on the hills however the more I wrote, the more Nathaniel's personality came out until I ended up with a proud young shepherd who realizes the Messiah is coming from the most humbling of beginnings. Serious Question: How often do you start out on a course of your own choosing only to find God has led you down a different path? Fun Question: Did you get what you wanted for Christmas? Anita, what a lovely story. This really resonated with me. I love the picture you created for me. And yes! Often. Very often. God leads me down a much different path than the one I began. And there's always something I learn, or some way I grow closer to Him. He never leads us down the wrong path. We just have to keep our eyes open and seek Him, trust Him, and know He's with us every step of the way down that path. our pastor's sermon Sunday was on Detours. Plan on them. We see a straight path and think that setbacks and trouble are detours but they are really God's path for us of growth, maturity and experiences that will help us bless others. At the first sign of trouble, we fear we've messed up; at the first difficulty or pain, we fear we're being punished. Our circumstances aren't all about us but about Him. Like Nathaniel, we make wrong assumptions but God uses us anyway. I can't imagine the fear I'd have, facing an angel (I don't think they look like Roma Downey) but are massive glowing, powerful creatures. After I picked myself up off the floor I imagine I'd pay pretty close attention! Great story, Anita! Lovely writing. We should do more of this. We are all fiction authors after all. I did get what I wanted for Christmas and a few nice little surprises also. We decided to get a flat screen TV for the family. That covered a number of presents. I also especially liked a digital scrapbook my son and daughter had made online. It's "The Sleiman Family Story." It starts off, there once was a boy named Dani Sleiman who met a girl..."
I feel kinda dense this morning 'cause it never dawned on me for us to write fictionalized story blog posts. When I was in high school, I knew God was calling me to marry a pastor. Well, that totally freaked me out. Why not ask me to be a missionary in one of the remote places in the world instead? Still, after struggling a year to submit to God's leading, I finally did. Then I "forgot" about it. Went to college, earned a degree in Communications with an emphasis in radio and television, and got a job reporting news at the local news radio station. Only problem was that three months into the job, I realized I despised reporting the news. The tipping point was having to reading a police report where a girl from high school had been arrested for prostitution. About a year later, I was married a youth & music pastor. Goes to show that while God allowed me to take my own wrong paths, He eventually brought me back to the right one. Now onto the non-serious question...yes, plus a few things I didn't put on my list but am glad someone got me anyway. A lovely story to start the day. It brought to mind a six-day hiking trip I took with a group of friends through the Drakensburg Mountains in South Africa. On the high burg ridge that separates the independent Kingdom of Lesotho on one side and then) Natal on the other, young boys shepherd flocks of goats. They live in caves, more overhangs than actual caves, and protect their flocks from predators - the most dangerous the two legged variety! It struck me that it was a lonely life for these children--like your young shepherd. And yes, I received everything I could want for Christmas. No gifts this year except for Malcolm Gladwell's new book and another non-fiction book on economics. It was a low key day, but nice. Suzie - You're so right. No matter where God leads us or how crazy it seems, He will never lead us wrong. Deb - I love your line - but God uses us anyway. That says so much for His love for us. I don't know what I'd do if faced with an angel such as those shepherds saw. However, I had a dream once where I was heading up the stairs and a duplicate of me was heading down. I stood on the landing, catatonic yet screaming on the inside as she passed, totally ignoring my presence. So that would be my guess - catatonic. Thank you for your kind words and insight, ladies. Dina - the digital scrapbook sounds like a lovely idea. I know other families have done the same but the closest my family has come is posting their pics on FB. They keep phoning and say they like the posts and pics on my blog, though so I'm thinking when I get my official website up and running, I should have a separate part for family. A Different Sort of Christmas Story just last week. Because I already posted about fear when I reviewed Max Lucado's book Fearless: Imagine Your Life Without Fear, I wanted to do something different this time. I don't know if there's an actual word to call fiction stories based on actual biblical events, but I read my first one years ago as a young girl. It was the story of Ruth and really opened my eyes as to the possibilites of a writer. This was my first attempt at such a 'fictionalized' story. Thank you for sharing your story, Gina. I can totally see you as a stubborn news reporter, LOL. PTL you caved and followed God's lead. Oh dear. I smell fiction blogging in the future. Like no way can I plot something for less than a thousand words. Yes, I should be willing to stretch myself creatively. No, I don't want to. Which is why Gina will ask us to, right? Wenda - how exciting your trip must have been! In researching a shepherds life, I used Living: Fascinating, Everyday Customs and Traditions from the people of the Bible, The Everyday Series, Thomas Nelson 2006. It tells of how shepherds would make a sheepfold much like you spoke of and use thorny bushes, etc as a fence between the boulders. The shepherd himself would lay across the single opening to guard his flock. Yes indeed, a scared, lonely life for these youngsters. Anytime you want to bring your kids to explore the amazing mountains, the zoo, or Chinook Mall you just give the word! And yes! That's exactly how they did it--herded the flock into the overhang and then built rock or bramble barriers. Incredible that shepherds in the 20th century do pretty much the same thing as in the 1st century. One afternoon a wind blew my flourescent pink ball cap off and by the time I'd turned around a young shepherd had dashed out of his cave to collect it. It always tickled me to think of a young shepherd high above Lesotho dressed in rags and wearing my Molson Canadian cap. Anita, maybe I described the present wrong. She made it online, but then ordered it and it came to us as a beautifully bound hardback book. Deb, maybe we could do book excerpts. Is that less scary? BTW, I'm zipping through edits this week on my WIP. One of these days I'll announce it's ready for prime time! Loved your story, too, Wenda. You've had a very interesting travel life! Have any of you read the Marjorie Holmes books, Two from Galilee and also Three from Galilee? Two writers in my online critique group are writing fiction based on the bible or at least during a familiar 'bible' time. I find it fascinating. The research seems overwhelming though. Both books take place in Egypt. Fascinating! Neat story, Anita. I've seen such stories about Christmas before, but yours had a bit of a different perspective - looking at the "fear not" idea. Of course, I also like it because of the shepherd's name too *wink - nudge*. I think I would be overwhelmed if an angel appeared to me like those in the Bible. I believe I'm better suited to entertaining Angels unawares. As for detours and life directions going a bit different than expected... been there, done that, bought the T-shirt and now doing the laundry. Sometimes I feel that the Lord likes changing things up to keep my life from being too boring. I didn't really ask for anything for Christmas this year, so everything I got was gravy, so to speak. After little Guppy's arrival, I've been feeling I don't need anything more. fun story. thanks for the perspective. Wenda - It's been years since I went to the Calgary Zoo and I'd love to go again and introduce it to my 2 youngest. Dina - You're right - I was thinking about a virtual on-line scrapbook. I can't visualize the one you're talking about - unless it's a battery operated photo album thing? Thanks for coming back and setting me right. I'll keep an eye out for the one you're talking about. DebM - Writing 1000 words is quite easy when you get down to it. I started by doing the bi-weekly challenges on www.eharlequin.com. It's run by members and we give each other a scene idea and then have to write it using 1000 words max. I really enjoy doing them but had to quit when Emma's story took precedence. Actually, the romance I wrote for Prairie Chicks called The Shepherd which posted on Dec 26 was originally written for last year's eharl challenge but I didn't get it finished in time. It seems I have a thing for shepherds, eh? Deb H - I know what you mean. My first child arrived a few wks before Christmas and it seemed my universe was complete. I love the name Nathaniel. Maybe it was uppermost in my mind because of you but when I asked my daughter for a biblical name, it was the first one out of her mouth, too. I'm very glad your life has changed the way it has. You sound so much more content than when I first met you over at the eharl challenge board.